Background: The cellular mechanism(s) underlying autism spectrum disorders (ASDs) are not completely understood, but ASDs are thought to ultimately result from disrupted synaptogenesis. However, studies have also shown that glial cell numbers and function are abnormal in post-mortem brain tissue from autistic patients. Direct assessment of glial cells in post-mortem human brain tissue is technically challenging, limiting glial research in human ASD studies. Therefore, we attempted to determine if glial cell-type specific markers may be altered in autistic brain tissue in a manner that is consistent with known cellular findings, such that they could serve as a proxy for glial cell numbers and/or activation patterns. Methods: We assessed the relative expression of five glial-specific markers and two neuron-specific markers via qRT-PCR. We studied tissue samples from the prefrontal cortex (PFC) and cerebellum of nine post-mortem autistic brain samples and nine neurologically-normal controls. Relative fold-change in gene expression was determined using the ΔΔCt method normalized to housekeeping gene β-actin, with a two-tailed Student’s t-test P <0.05 between groups considered as significant. Results: Both astrocyte- and microglial-specific markers were significantly more highly expressed in autistic PFC as compared to matched controls, while in the cerebellum only astrocyte markers were elevated in autistic samples. In contrast, neuron-specific markers showed significantly lower expression in both the PFC and cerebellum of autistic patients as compared to controls. 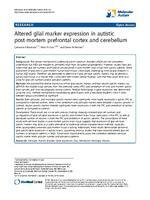 Conclusions: These results are in line with previous findings showing increased glial cell numbers and up-regulation of glial cell gene expression in autistic post-mortem brain tissue, particularly in the PFC, as well as decreased number of neurons in both the PFC and cerebellum of autistic patients. The concordance of these results with cell-level studies in post-mortem autistic brain tissue suggests that expression of glial cell-type specific markers may serve as a useful alternative to traditional cellular characterization methods, especially when appropriately-preserved post-mortem tissue is lacking. Additionally, these results demonstrate abnormal glial-specific gene expression in autistic brains, supporting previous studies that have observed altered glial cell numbers or activation patterns in ASDs. Future work should directly assess the correlation between cell-type specific marker levels and cell number and activation patterns.